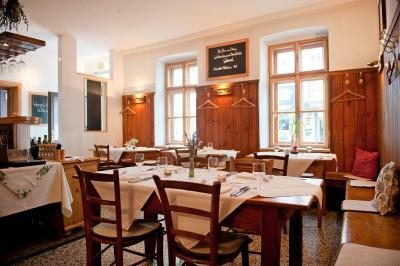 Lock in a great price for Schreiners Essen und Wohnen – rated 9.7 by recent guests! 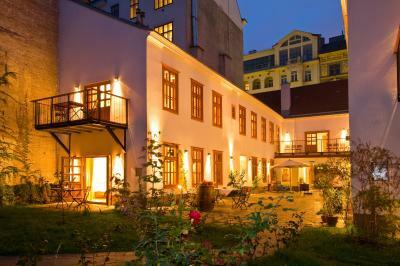 Very cozy accomodations, with great, recently renovated, decor. 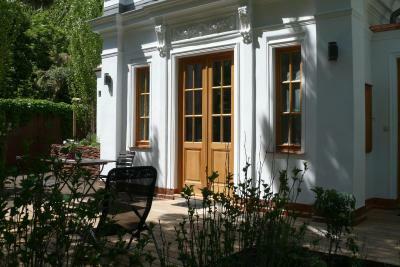 Room was large, and included a patio overlooking a lovely garden. 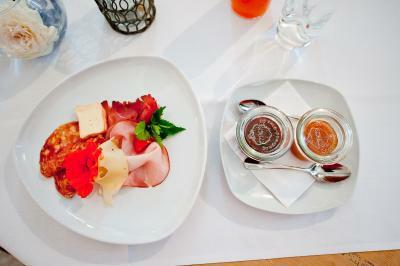 A great breakfast, with outstanding coffee (get the cafe melange), homemade jams, and eggs cooked perfectly. Central location with public transport steps away. This place has so much charm and pays a lot of attention to detail. It was a joy staying there. The neighborhood was perfect as well. 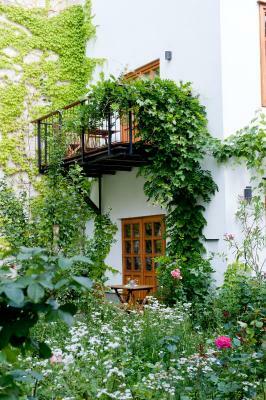 Property is small and intimate. Room was well appointed and extremely clean. 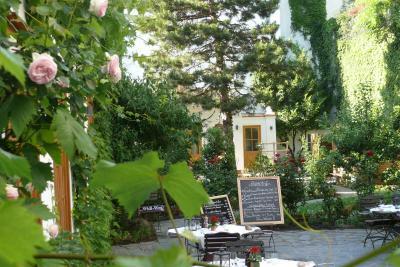 We had great weather so we had breakfast and a meal in the beautiful courtyard. Tram station is right outside the door so very easy to access the downtown historic area. Very accommodating host and hostess. Highly recommended. so cute... breakfast great. We enjoyed it one morning in the lovely patio. next inside due to the weather, but still fun to watch the... soooo convenient ..tram go by. Checkin a little different. I wish I had known about calling from the front door on your phone when you get there. (just so that I was prepared) I was very jet lagged .. and my luggage kept rolling into the street! but the restaurant was open so it all worked out well. 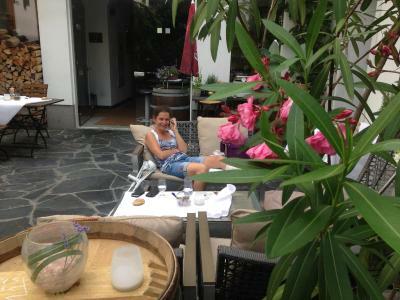 We had a cute little patio which I loved with my morning coffee. 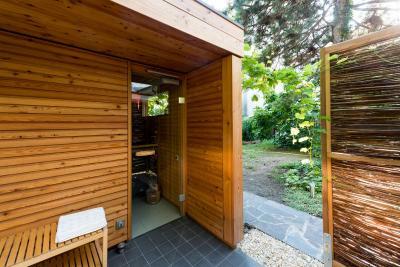 Beautiful room with nice amenities (rain shower with good water pressure, nice bathrobe, etc.) and a lovely outdoor space that even had an outlet so I could get some work done on my laptop using the wifi while enjoying the garden. I unfortunately didn't get to try the restaurant but the included breakfast of breads, meat and cheese plate, yogurt, egg, and cappuccino was excellent. It's also well-located with easy access to several train and tram lines. I wish I could have stayed here longer! I wish I could give this hotel more than 5 stars, because it is was that good. 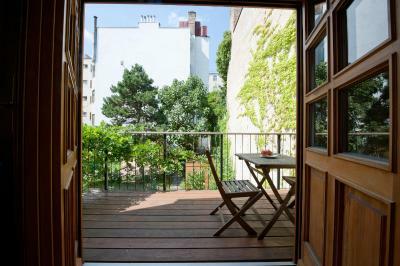 While the street side exterior is unremarkable, the doors open to a beautiful and welcoming interior. It’s like stepping into another world, peaceful, quiet, and impeccably decorated. 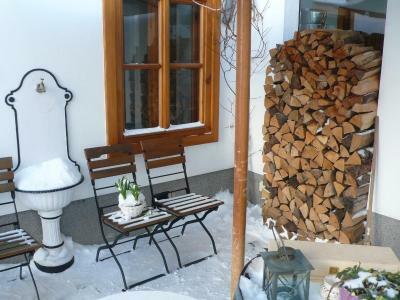 We stayed in the guesthouse, which is separate from the other rooms, and features it’s own fireplace. The owners were very kind and gracious, and were waiting to personally welcome us. This wasn’t your typical hotel experience, it was like staying with family. The room was spotlessly clean, and fully stocked with everything you could possible need. 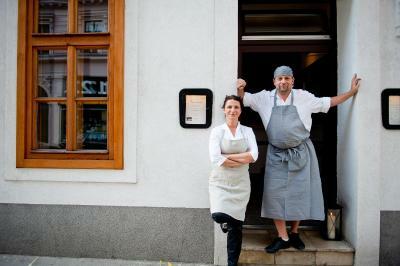 We had dinner at their restaurant one night, and it was fabulous. 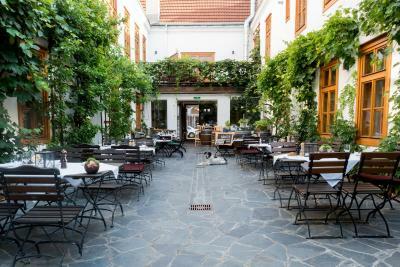 I honestly cannot say enough good things about this B&B, and if we ever come back to Vienna, we would gladly stay here again. The whole experience of being here is lovely. The staff (especially Angela) were kind and friendly, the room was huge and comfortable, and the included breakfast was delicious. 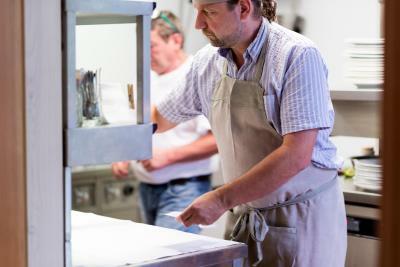 They'll cook your eggs to order along with the included bread, cereal, jams, yogurt/fruit, meat/cheese plate, and whatever coffee or tea you would like. 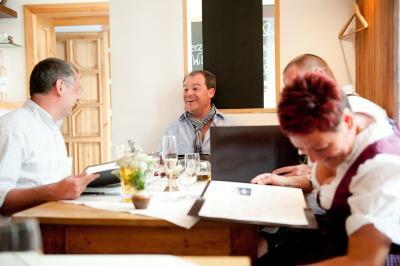 We recommend taking advantage of booking a dinner here during the stay. (Just let them know one day in advance.) You will want to have a phone if you're checking in when the restaurant isn't open. The door will be locked with a note including phone #s to call to be let in. It only took a minute to have someone at the door, but they may not hear you knock when you arrive! Breakfast! It was amazing. In the weekend, there were some slices of cake in each tables. In addition, the stuffs were very kind and nice. 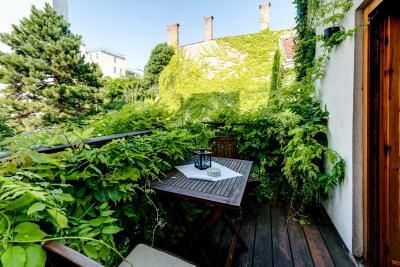 In a quiet location in Vienna’s trendy district of Neubau, Schreiners Essen und Wohnen is a 5-minute walk from the Burggasse-Stadthalle Underground Station (line U6). 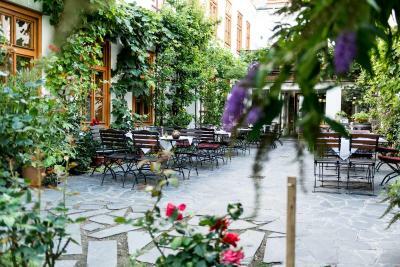 It features a classic Viennese restaurant, a private garden, and free WiFi access. 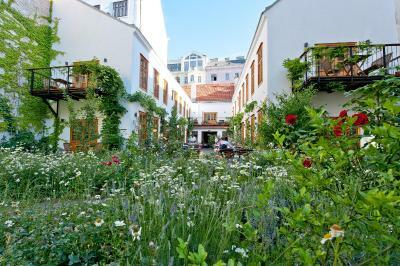 The spacious rooms come with a balcony or terrace overlooking the garden, a king-size bed, a flat-screen cable TV, a seating area, wooden furniture and floors, and a bathroom. 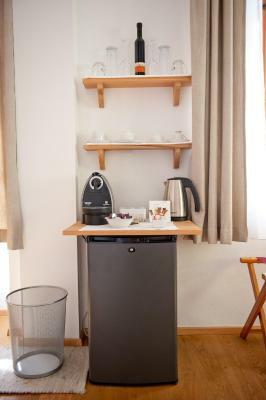 A coffee maker, an electric kettle, and a mini-bar are provided. 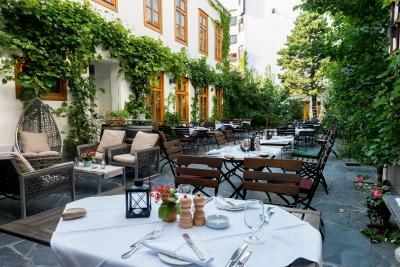 Austrian cuisine and Viennese specialties, as well as a selection of fine Austrian wines and beers, can be enjoyed in the restaurant from Tuesday to Friday. Herbs are sourced from the hotel’s garden. The Westbahnhof Train and Underground Station is 1,950 feet away, and the city center can be reached by public transport in 15 minutes. The Museum Quarter is a 20-minute walk away. 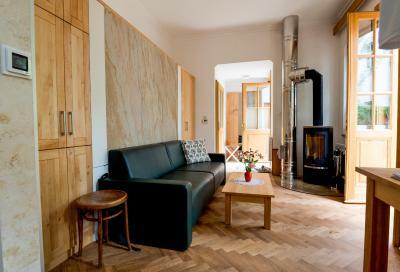 When would you like to stay at Schreiners Essen und Wohnen? This double room features a cable TV, mini-bar and bathrobe. 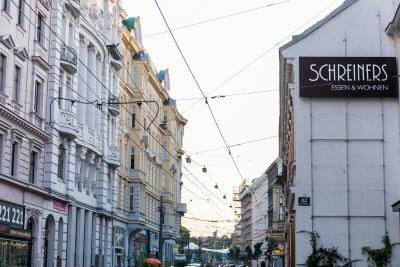 Schreiners hotel and inn is in the middle of the lively 7th district in Vienna. 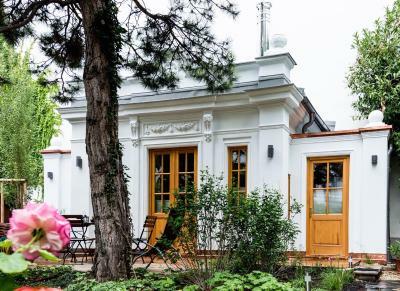 The 200 year old Biedermeier Ensemble was completely renovated by Angela and Thomas Schreiner. 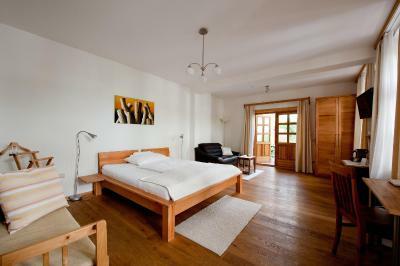 Schreiners offers spacious and tasteful rooms with either a large balcony or a terrace. 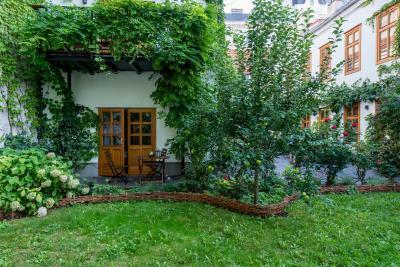 A special highlight since 2015 is the small Biedermeier gardenhouse - called "Salettl" - with large patio in the green backyard. In the middle of the town you have here a little jewell for your stay. And some say, the best thing about Schreiners is that it doubles as an inn. 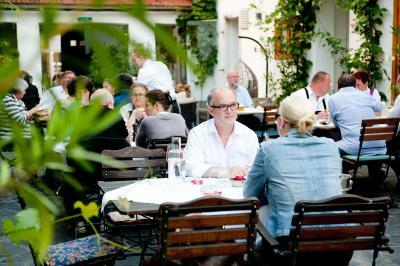 Opening hours: Tuesday till Friday from 6.00 pm till 12.00 pm. 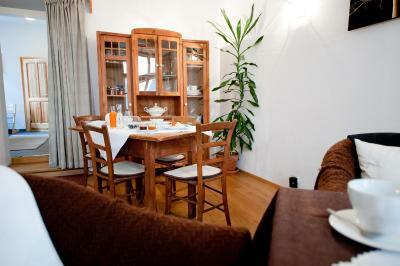 That means if you want to relax and enjoy yourself after a long day of sightseeing or business meetings, you can simply stay at home for dinner. 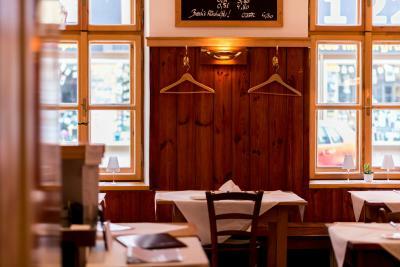 House Rules Schreiners Essen und Wohnen takes special requests – add in the next step! 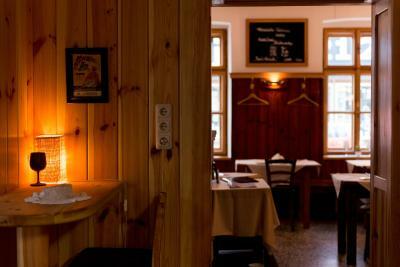 Schreiners Essen und Wohnen accepts these cards and reserves the right to temporarily hold an amount prior to arrival. Please note that baby cots and extra beds come at an extra costs. Please note that the restaurant is only open from Tuesday to Friday. Please inform Schreiners Essen und Wohnen of your expected arrival time in advance. You can use the Special Requests box when booking, or contact the property directly using the contact details in your confirmation. The only one unfortunate thing was that tiny ants easily come into my room. I fought with ants. I know it was ground floor. So, there is nothing for it. A delightfully tranquil little place. 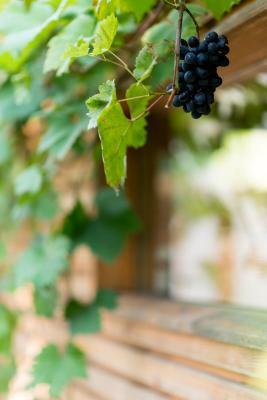 It was too early in the season to fully appreciate the garden but nevertheless it was a wonderful stay. Breakfast was excellent. 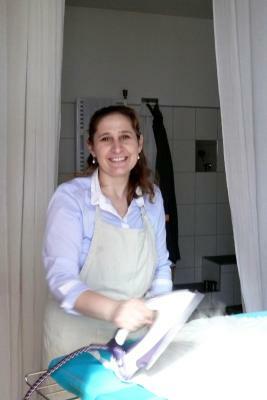 Extremely clean, friendly and welcoming. I am a professor of Radiology at Cairo University and I have been traveling to Vienna every year since 2005. NEW HOTEL EVERY YEAR, I experienced all types of hotels THIS HOTEL IS THE BEST. 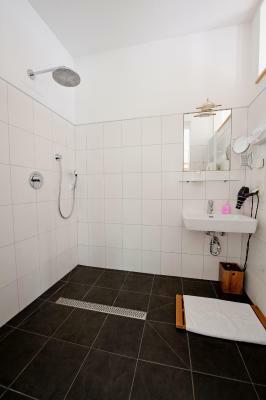 It met my OWN requirements cause I was looking for a quiet, cheerful, open view to see the daylight cause I hate closed room ALL OF THESE I FOUND IN Schreiners Essen und Wohnen. For the breakfast it was outstanding quality on top is the baked products by Angela and I was not able to resist but to purchase few of it while going back home for my daughter. I tried for dinner and Thomas cooked that outstanding soup for me cause I was feeling a bit of sore throat. thanks, Angela and Thomas also one of the staff was soooo helpful I can't recall her name but from Bosnia, I would report to her boss that she is great in hosting the customers and making them feel at home, sorry that I can't remember her name but wanted to report this for her boss Angela and Thomas . Nothing. Breakfast is very nice with good quality produce and homemade jams...not buffet style which some people might prefer in terms of being able to have second and third helpings. 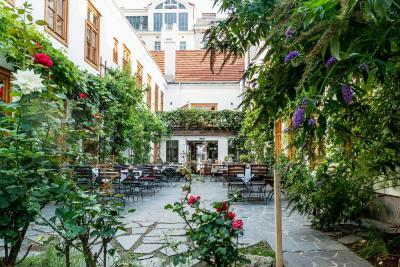 Hidden gem in heart of Vienna (5-10 mins from Stephansplatz by metro)... Hotel is small and cosy with rustic interiors, one quickly feels at home here. 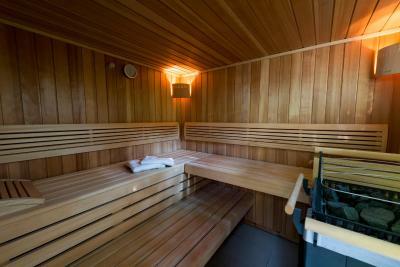 Rooms extremely spacious with bathroom and separate toilet and tea and coffee making facilities and small fridge. 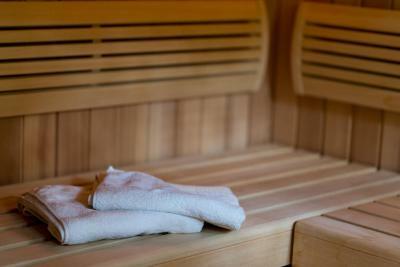 Staff and owners were very accommodating and put on the sauna for me whenever I requested it. 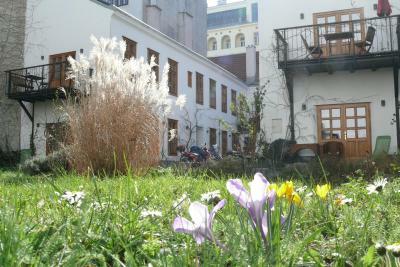 Wouldn’t hesitate to stay here again when back in Vienna. 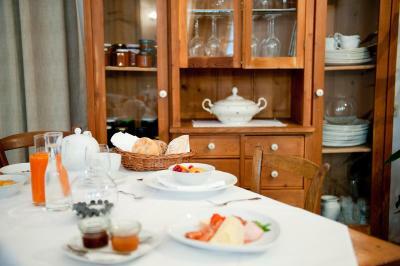 A little bit more variety for breakfast, such as pastries and perhaps omlettes. Nothing to complain about at all . Great breakfasts . Excellent location . This is a nicely situated hotel . We stayed there to attend a Paul McCartney concert at the Weiner Stadhalle which was an 8 minute walk away . However the number 49 tram stops just down the road so you can be in the Museum Quarter in 8 minutes as well . And only 20 minute walk if you want some fresh air . Room was excellent .....we stayed in the one at the end of the garden which was very quiet and private . Nice tavern feel to restaurant and we ate there one night as we arrived late evening . 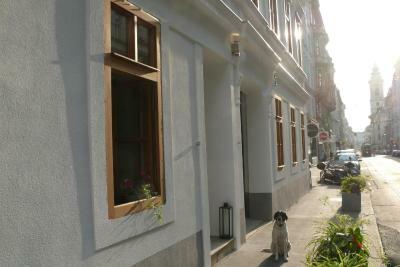 If we ever went back to Vienna we'd stay here again. 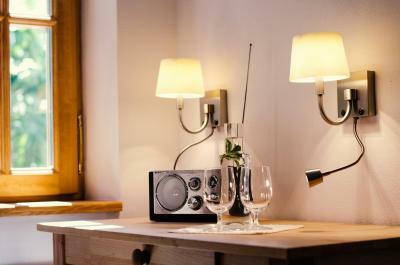 Highly recommended and a great change from the good quality but boring chain hotels ! I noticed that on weekends the hotel is under-staffed and therefore service in the rooms is not as good as during the week. However this did not interfere with our lives. The hotel as a whole: the warm decoration - very comfortable and cousy; the generous size of the bedroom; the breakfasts and the restaurant (food is excellent although you need to book in advance); its owners, particularly Angela; the trust they had on us: we were given the key of the hotel main entrance; and Otto, the dog. I felt at home! 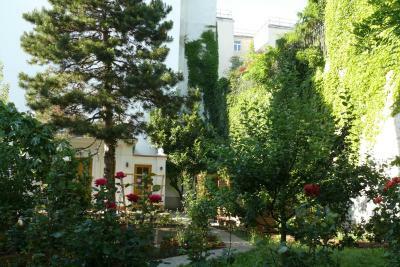 This is a small hotel where I would like to return on another season to enjoy the wonderful gardens of Viena. Breakfast started 0800hrs more flexibility required for an early start. The breakfast was excellent the room was spacious and had everything required when on holiday.